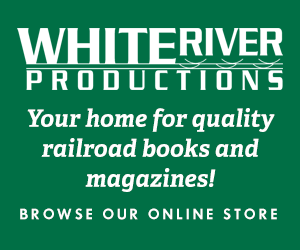 Mantua introduced its first cataloged 50-foot boxcars in its 1980 product catalog. 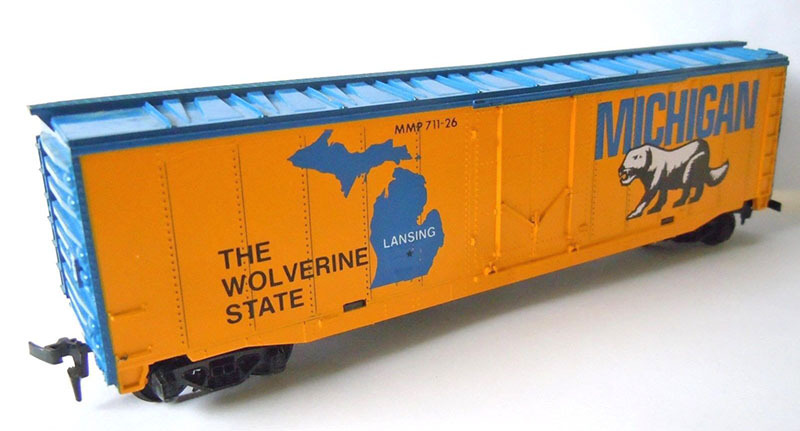 The series appeared as Mantua’s “Commemorative State Box Cars” and carried 711 base-model numbering with a two-digit suffix stock number noting the state. Examining the stock numbers present in 1980’s listing, you’ll see no entry for No. 711-1. The series starts with Pennsylvania (No. 711-2) and tops out with Arizona (No. 711-48). There are many missing stock numbers in the 1980 list, which features 24 releases. 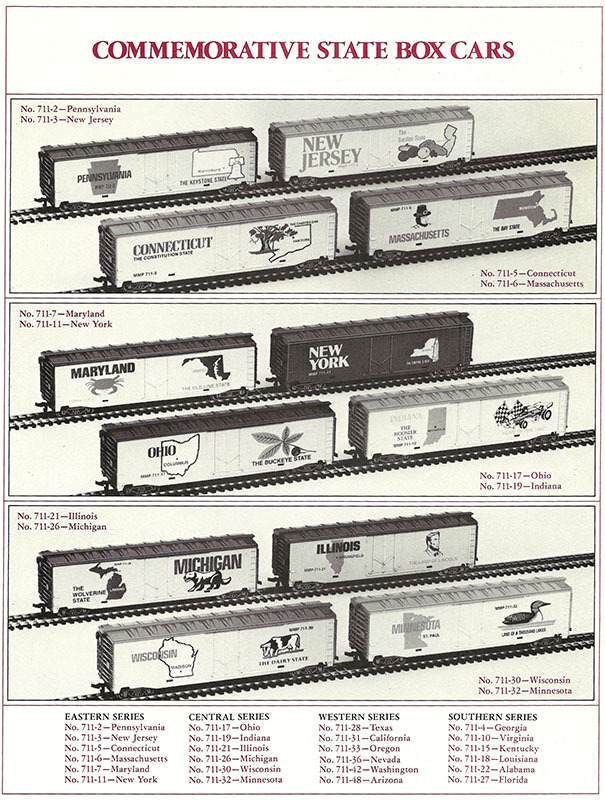 For 1981, Mantua’s catalog takes the original four region series (Eastern, Central, Western, and Southern) and renames those Series 1, 2, 3, and 4. New in 1981, Mantua adds Series 5, 6, 7, 8, and 9. Series 5 through 8 all included six releases each, while Series 9 possessed only two offerings. When complete in 1981, the series ran from Delaware (No. 711-1) through Hawaii (No. 711-50) and numbering replicated the order states joined the U.S. The colorful collection of models used the later era tooling for this 50-foot plug-door that featured solid or filled-in stirrup steps. The 50-foot plug-door boxcar saw introduction in the late 1960s in TYCO’s line and the revision to solid stirrups steps appeared in the 1970s from TYCO. Research indicates that broken step complaints ranked high of consumer feedback lists that TYCO was observing by the early 1970s. The result was a number of molds received modification to make the steps more durable. This modification entailed filling in the open frame design of the stirrup steps on a number of freight cars. For this series of releases, Mantua divided the offerings into regions of the United States. The 1980 catalog illustrates a dozen examples and lists the full collection across the bottom of the page separated into the four regions: Eastern, Central, Western, and Southern. Dealer packs provided two models each from each region. The model listed for $4.00 and came fully assembled with plastic friction truck sideframes with plastic wheels and plastic X2f couplers mounted to the trucks. At the time of debut, Mantua had not re-introduced the early 1960s Lindberg rolling stock, which would go on to make up the bulk of the “new” Mantua’s freight car line for the 1980s and beyond. When the Commemorative State Box Cars first appeared, Mantua’s listed rolling stock consisted of the 1860/1890 Vintage Car Kits and Extruded Aluminum Streamliners. 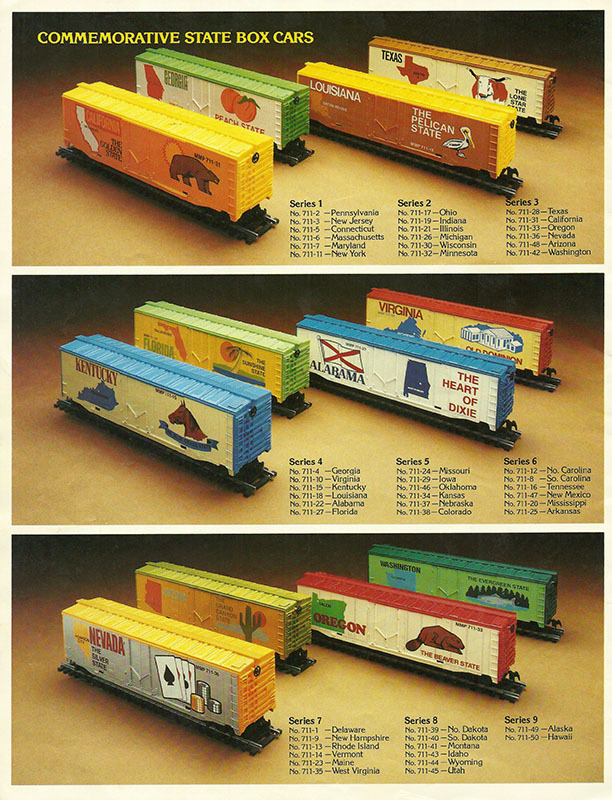 By 1983 or 1984, this collection of boxcar models is absent from Mantua’s line. Once out of the package, these releases might easily be confused with TYCO items. TYCO did offer a series of state cars in the mid-1970s as part of its U.S. Bicentennial offerings, which are similar in design and also utilized the 50-foot plug-door boxcar tooling. Generally, presentation follows an alphabetical approach on the HO-Scale Trains Resource; however, for this set the releases are shown in numeric order using Mantua’s stock numbers.